My wife and I watch Bachelorette sometimes. 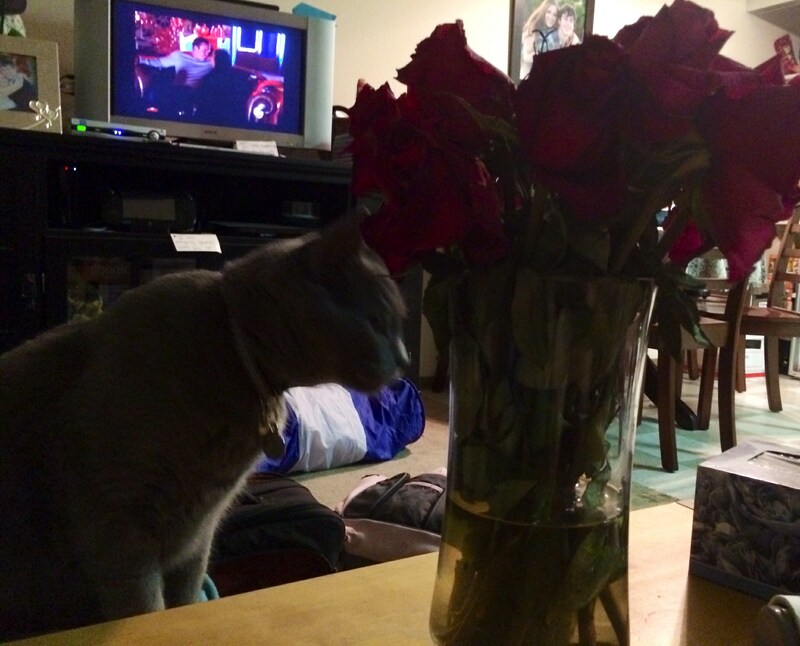 No roses for kitties on the show though! My wife likes to watch the ABC show, The Bachelor, and I like my wife so I watch with her. The Bachelor is a reality show where one man is courted by 25 women at once. The first episode introduces the Bachelor and the eligible women. Subsequent episodes cover the dates the Bachelor goes on with one woman at a time or many. At the end of the dates one woman on the date gets a rose, signaling that the date was successful. At the end of the episode the Bachelor hands out additional roses, only there aren’t enough for all the women. Like a game of musical chairs, some are left without roses and eliminated. Eventually only a few women are left and the dates get more serious (meeting families and scandalous overnight dates). When there are only two women left the Bachelor must choose one. The show encourages a proposal at that point, but it doesn’t always happen. Sometimes the relationship doesn’t even continue at all from that point. The show’s purpose is to create marriages, after all 1 out of 25 women should be marriage material, right? The show’s track record is pretty bad though. 1 in 10 of the seasons ends in a successful marriage. Originally there was only The Bachelor, but now there is The Bachelorette. It’s the same show with a woman as the central character and 25 men vying for her attention instead. My wife likes it a lot. I feel like its forced drama by people who aren’t actors. The creators and the people on the show have admitted that the conflicts on the show are largely fabricated. Two people might be fighting, but they were told to fight by the producers. Two people might seem to be insulting each other, but the show edits out the laughing afterwards at the ridiculous insult. Instead a frown is edited in from a different conversation. Regardless of all that stuff it is still fun to hear about the drama and who gets eliminated. I’ll continue watching the first few minutes with my wife every week and then getting bored and wandering away. She’ll fill me in on the rest afterwards. And unfortunately, all my favorite characters keep getting eliminated.